St. Patrick’s Day often falls during the period of Lent due to the fact that Easter is not celebrated on a fixed day. If the feast of St. Patrick falls during Lent, which is a fasting period, the fasting does not have to be observed. If St. Patrick’s Day falls during Holy Week, the 7 days leading up to Easter, the Catholic Church will reallocate the date of the feast. This last time this happened was in 1940, when St. Patrick’s Day would have fallen on the same day as Palm Sunday. The Church moved the date to the third of March, to avoid a conflict. Thankfully, this does not occur very often. The first Saint Patrick’s Day parade in the US was held in Boston in 1737. The parade was put on by the Irish Society in Boston. The color for St. Patrick’s Day is green. The most recognized symbol of St. Patrick’s Day is the shamrock. It is said that St. Patrick used the shamrock to help explain the holy trinity. In Canada, St. Patrick’s Day festivities date back to 1759. The Day was celebrated by Irish soldiers stationed at the Montreal Garrison. They were part of the British forces who had been occupying the area since the defeat of New France. The first St. Patrick’s Day Parade was held in Montreal in 1824, and has been held every year since. The biggest parade in England occurs in Birmingham. This parade is said to be the third largest St. Patrick’s Day parade in the world. The largest St. Patrick’s Day in the world is in New York City. An average parade will have more than 150 000 people involved. The second largest St. Patrick’s Day parade is in Dublin. In 1961 Chicago began dying it’s river green to celebrate St. Patrick’s Day. The sewer crews in the city who had been using green dye to check the sewers for a problem came up with the scheme. Indianapolis also thought this was a great idea and are now dying their main canal green. The fountains in Savannah are all dyed green for the holiday. In 2009 the fountain on the White House grounds was dyed green. Many cities in the USA paint the stripe down the middle of the road green to both mark the parade path and as part of the festivities. The Alumni from Missouri University paint the entire road green for 12 blocks. The NHL team the Toronto Maple Leafs had been called the Toronto St. Patricks from 1919 to 1927. In 1999 the Leaf’s were scheduled to play on the March 17th so they brought back the retro green jerseys for their game. Saint Patrick Day feasts often include, corned beef and cabbage. Irish stew is another popular dish or any other meal centered around lamb or mutton. If these are not to your taste, many people simply plan a green themed meal or they dye foods and beverages green as part of the festivities. 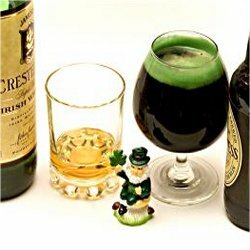 This entry was posted in Holiday Trivia and tagged saint patrick's day trivia, St. Patrick's Day Customs, st. patrick's day taditions by Jane. Bookmark the permalink.